We've been planning to build and document the process of an engine build here for a while, and since our Spec Miata engines are built by Laz at Mesa Balancing (which would be hard for us to document), the first culprit was going to be the leaky 170K+ mile stock engine in John's 1999 Mazda Miata daily driver. We procrastinated on rebuilding an engine for this car for so long due to other projects, racing, and of course funding. We just kept band-aiding the problems that arose with the engine to keep it going until we could build the engine we wanted for it, most of which were oil leaks that were just plain annoying, but not critical. Well... that was fine until a few weeks ago when the car started consuming about a quart of oil a day and losing oil pressure on the morning commute because it was so low. How does a car lose that much oil in such a short amount of time with the oil pan drain plug in? Originally we thought it was the cheap OEM aftermarket replacement valve cover gasket we had on there, it never seemed "thick" enough (Here's a hint: never buy a valve cover gasket from Moss Motors! They're not actually "OEM" parts) and it always seemed to weep oil around the back (yes, we of course siliconed the corners by the cam rises), so we replaced it with a much nicer (and thicker) OEM Mazda valve cover gasket. We replaced the front main seal twice (again, don't buy seals from Moss Motors), the second time with a quality OEM Mazda seal in a previous band-aid repair. We also replaced the cam seals when we did the front main, and of course the always leaky rear main seal was already replaced when we put in the lighweight flywheel and clutch. After replacing the valve cover gasket, we started the car to check operation only to find about a 4" diameter pool of oil on the shop floor when we backed it out. So where else can the oil be leaking from? The only thing we could think of was the head gasket, as there seemed to be another pool next to the oil, but this was water. 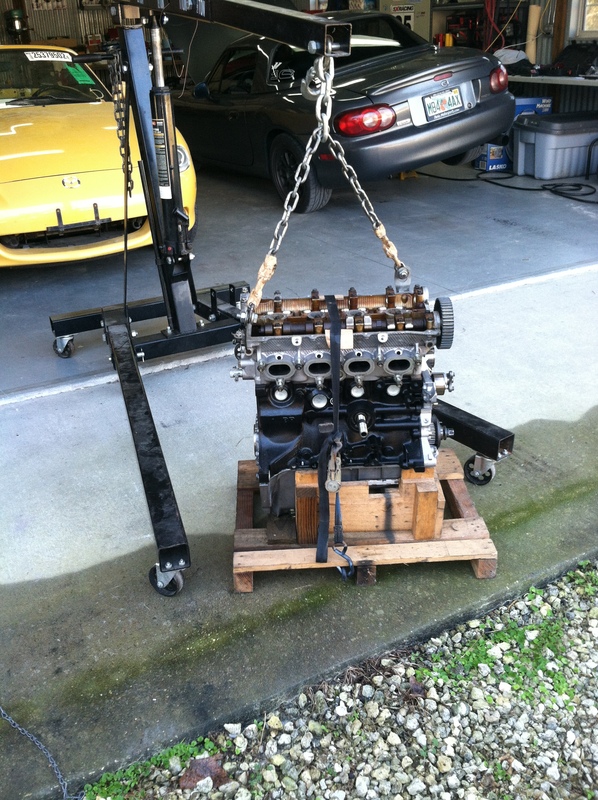 Damn, looks like we might as well build that new engine if we have to go as far as replacing a head gasket! Have Mesa Balancing bore the block 0.020 over to make way for a set of 83.50mm (.50mm oversize from the OEM bore size of 83mm) Wiseco Sport Compact Pistons. We chose to go with .20 over instead of .40 over for the purpose of another overbore in the future to extend the service life of the block in case of a failure or future oversize. Install Manley H-Beam connecting rods to handle the increased compression ratio, and to prepare for a future supercharger if we can. There's no harm except an extra expense in upgrading the rods, especially if you're thinking of forced induction in the future. The stock rods should be "ok" for the amount of horsepower we are going to be making, but it's the feeling of confidence in handling anything we want to throw at it, and the ability to NOT have to rebuild the lower end and add stronger rods in the future if we supercharge it. We're thinking of it as being "pro active"
We are choosing to upgrade the pistons because we need to bore the cylinders as they are out of tolerance, which is going to require us to purchase new pistons anyways. We chose the Wiseco pistons because they meet our goal of a compression ratio of 10.5-11:1 in the 83.50mm package. Also, Laz stressed the importance of the 7cc dome dish on this piston, making mention to us that we must use a piston that meets or exceeds a 7cc dome. We're not quite sure on this, but will certainly find out more and update this post. We also feel good spending the extra money on the Wiseco's over the Supertech's we were going to use because Mesa uses the Wiseco's in STL class Miata engine builds, which can see upwards of 170whp. I don't think we'll see those numbers with our build, but it sure gives us a "warm fuzzy feeling" knowing that these pistons are proven in race cars! Alternatively we could have went with a Mazda OEM 0.20 oversized piston from a 2001+ Miata engine to acheive the same compression ratio, however there wasn't a huge price difference between the Supertechs and OEM Mazda pistons, and only less than a $100 difference between the Supertech's and the Wiseco's. Any route could have been taken here, we went with the Wiseco's for the reasons above, and because they were highly recommended by Mesa. The Manley rods were chosen because we found them to be the most affordable to us through our suppliers, and not to mention Manley makes a damn nice rod! Our other choices were Eagle H-Beam rods (budget level rod, about the same price as the Manleys), K-1 Technologies H-beams (mid-priced, high quality rods) and Carillo H-beams (very expensive, super high quality rods!). We would have ideally went with the K-1 rods as they are made by Wiseco and would have been a good match to our pistons, but we wanted to maintain a somewhat conservative budget on this build. Rods can get expensive, and with the horsepower levels we'll be pushing, we don't see the need for a super strong expensive rod, so we went with the budget friendly Manleys that will certainly handle anything we throw at them shy of 500hp. We will outline the difference in Miata rod offerings in a future post, and hopefully have them on the site for price comparisons by that time. The bearings were chosen because if we're gonna put nice pistons and rods in the engine, we might as well put nice bearings in there too! Alternatively we could have went with the OEM Mazda bearings, or another aftermarket manufacturer as there are tons of options. Mesa recommended the ACL Race Series as he is familiar with them and they are race proven from his previous builds. All of the parts we're using in this build will be available for sale on our site. Also, we will be offering non-Spec Miata engine programs through Mesa Balancing in the near future, such as this build. This is our "beta" test engine in order to research engine packages for our new program, we wanted to experience it first hand so we know exactly what to offer our customers. Next comes the top end, or head in 4-cylinder engine terms!